Morten Harket - Do You Remember Me? A 1 track UK promo of "Do You Remember Me?" was available in the UK on 12 May 2014. It comes in a PVC wallet with a folded paper insert. It features the "Album Version" (4.04) of "Do You Remember Me?". The cover artwork shows a black and white shot of Morten walking down the street holding his guitar over his shoulder. The titles are printed at the bottom. 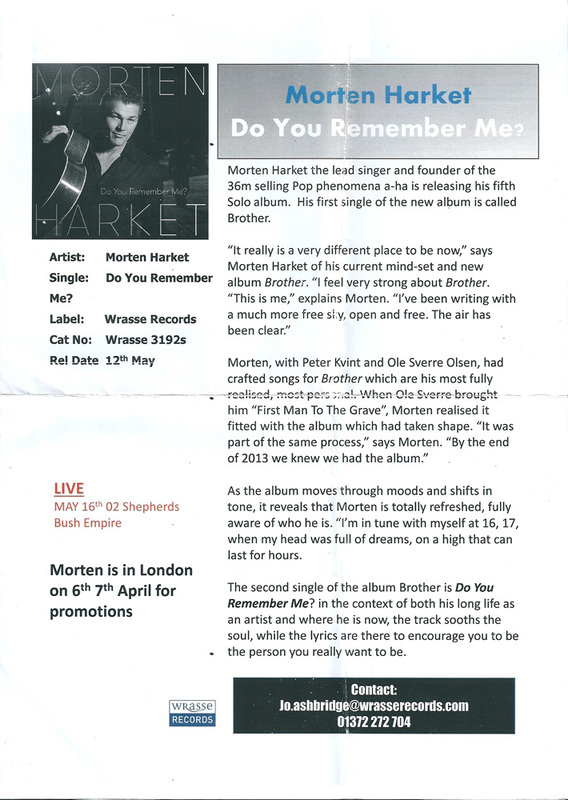 There is also a white rectangular sticker on the front with Morten Harket and release date in black. The back of the insert is white with the titles, release date, catalogue number and contact details in black. There is also the blue and white "Wrasse Records" logo. The disc is white with titles, release date and contact information plus the "Wrasse Records" logo. There is a 1-track German promo of "Do You Remember Me". It comes in a card sleeve with cover art similar to the UK promo. It features the "Album Version" (4:02). The back sleeve is black with titles in white, including track and copyright information. "For promotion only" is printed at the bottom of the sleeve. The disc is black with titles in white.